The White Mountains of New Hampshire are a popular place to getaway during the summer months. The Sugar Hill Inn is a romantic getaway known for its culinary adventure, and its warm, inviting guest rooms and cottages. Nestled at the gateway to some of the most popular attractions in the White Mountains, such as Franconia Notch State Park and Mount Washington, there’s no better place to stay this summer than our luxury Bed and Breakfast. Book your room with us today, and enjoy these 9 activities in the White Mountains when you visit us this summer! Take a Zip Line Tour. Fly thru the tree tops at speeds of up to 30 miles per hour at Bretton Woods Canopy Tours or Alpine Adventures. Experience The Flume Gorge. The Flume is a natural gorge with spectacular waterfalls, vistas and covered bridges. Cannon Mountain Aerial Tramway. An 80-passenger cable car brings visitors to the 4,080-foot summit of Cannon Mountain in under ten minutes. On a clear day, you can see the mountains of four states and Canada! At the summit, you’ll find spectacular scenic walking paths. The White Mountain Trail. The 100 mile drive offers New England’s most rugged mountain scenery as it travels easily through three historic “notches” or mountain passes. Views abound of villages and unspoiled National Forest. 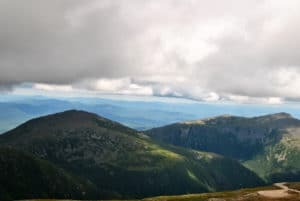 Stops include views of Mount Washington, mountain cascades, wildlife, and the Appalachian Trail. Visit the Mount Washington Hotel. Enjoy a cocktail or lunch on the back deck of the Mount Washington Hotel. The views are amazing, and the architecture of this grand old hotel is delightful. Climb Mount Washington. Mount Washington is the highest peak in the Northeastern United States at 6,288 ft (1,917 m), and is famous for dangerously erratic weather. You can hike to the top of Mountain Washington, drive the Auto Road, or get to the top aboard the Cog Railway. Hiking is recommended only for very experience and well equipped hikers. Go for a bike ride. The 9 mile recreation trail thru Franconia Notch is the perfect choice. Rent bikes at the Cannon Mountain Tram and return them at the Flume. A free shuttle will take you back to your car, and along away you’ll enjoy some of the best scenery in the White Mountains. Hike to a Waterfall. 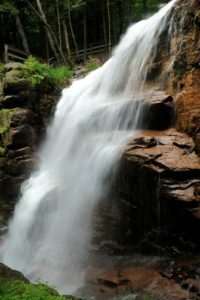 With over 100 waterfalls in the White Mountains, one is never far away. The Falling Waters Trail, a popular 1.4 mile hike will bring you to Walker Cascade, 20’ Stairs Falls, 60’ Swiftwater Falls and 80’ Cloudland Falls. You can read a recent blog about more options. Shop for Antiques. The country towns of Sugar Hill, Bethlehem and Littleton are known for their numerous antique shops. In the evenings, return to the luxury accommodations of the Sugar Hill Inn, and enjoy a delicious world-class dinner at our on-site restaurant, which has won a variety of distinctions and awards over the years. Make your reservation at our luxury Inn today!